Brian Hudson BLOG: How do you pack your gear? I posted this over on Flickr, and thought maybe it'd make a good post for the ol' blog. This is most of the camera gear (on the electronics side) I own. Check notes on the Flickr page for details. 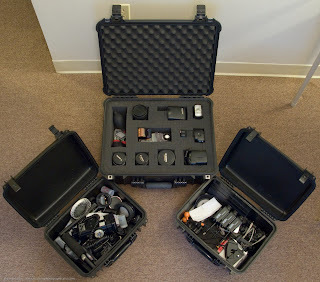 In the Pelican 1550 (center), I carry my cameras & glass--everything except the 70-200 f2.8 IS. Still trying to figure out whether to stuff it in here or not. I'll probably end up getting the padded divider kit for a little more stuffing room. In the Seahorse SE520's, I carry all the miscellaneous stuff--wires, filters, spare clamps, bungees, Pocket Wizards, whatever. I usually only travel with one, so it's my "useful" case and the other is mostly for storage. I throw a reusable silica pack in each box just for good measure. Most of the time I pack out what I need in a Lowepro Vertex 300AW, but this is how I store everything when I won't be shooting for a while, or going on long road trips. I originally got these boxes when I was the ship's photographer onboard USS LOS ANGELES (SSN 688). They were much safer being stowed in the belly of the beast, since it's near impossible to move about without banging against everything. Plus, in a submarine atmosphere (which contains multiple known carcinogens, and is a generally oily and unpleasant environment) the airtight seal protected my gear from contamination from airborne refrigerant, oil, polyamine, and paint fumes. Not included is my laptop & paraphernalia, other travel options, and my light stands & modifiers. Stay tuned! Nice setup. I like the layout. I have a couple of the Pelicun cases from my submarine days also. Just not using them for my current camera gear.